Tigers and tigresses rule the jungles of central India. They gracefully indulge the tourists by making frequent appearances across the paths defined for tourists. No wonder we keep going back to Kanha for Munna Tiger. 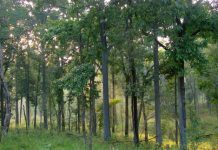 Bandhavgarh is a guaranteed sighting spot for tigers, though I discovered so much more to it when tigers decided to give me a miss, including the fort of Bandhavgarh. This time at Pench National Park, I hoped to see tigers but I was prepared to miss them as well. Tigers it seems sensed it and obliged with as generous a ‘darshan’ as possible. 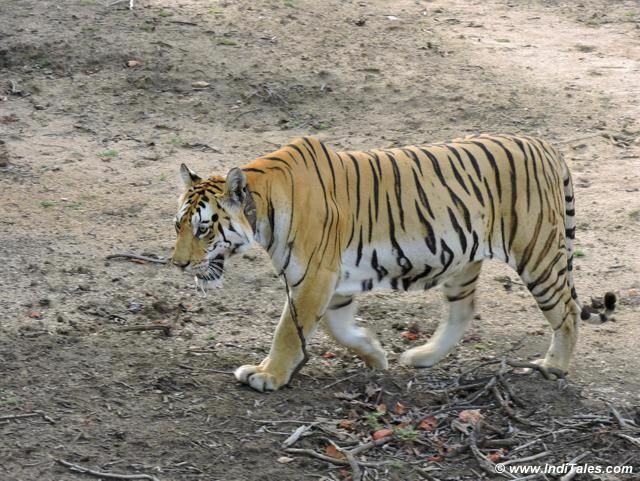 Collarwali Tigress – the famous tigress of Pench National Park, walked with her cubs. They crossed our path so many times that if I had the guts I would go, give them a bear hug and say Thank You. Collarwali is so called because there is a collar around her neck. A radio-collar was put on her when she was a young to keep track of her movements. Radio Collar has been long defunct but it continues to hang around the neck and has become the literal identity of this tigress. Collarwali is the daughter of once famous tigress Barimada, who featured in the famous documentary ‘Spy in the Jungle’. She has taken over a substantial territory of her mother. Some of the adjoining territories belong to her sister known as Baghinnalawali. Her father was T-1, also called the Charger of Pench. 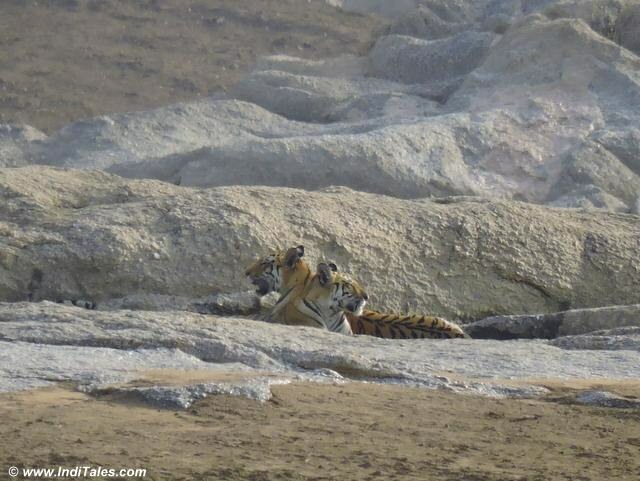 Collarwali Tigress is also known as Mataram and technically she is T-15. I call Collarwali tigress the Queen Mother of Pench forests for giving birth to 22 cubs so far. Her first litter was in 2008. The ones you see in the video were born last year in 2015 as part of her 6th litter. She must be a boon for all those who are working towards increasing the number of tigers in India. Forest officers at Pench National Park believe that 22 cubs from Collarwali tigress, is a kind of record in itself. Very soon her lineage will rule the jungle– is that not a sign of ‘Queen Mother’ of Pench National Park. Read more about the family of Collarwali in this Sanctuary Asia article. 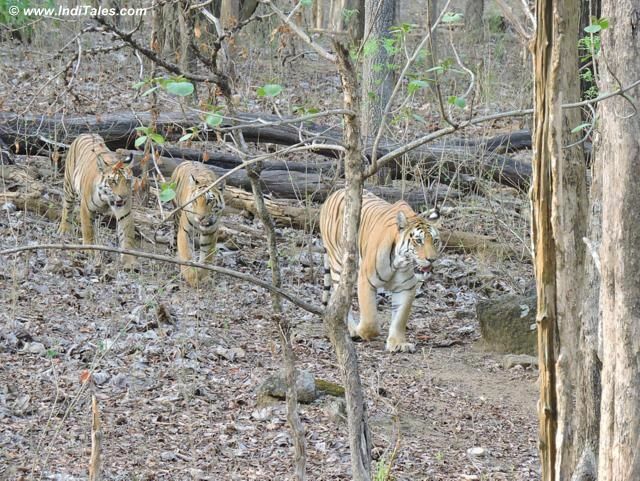 Collarwali tigress with her cubs is the most commonly sighted tigress at Pench National Park. As soon as you enter the national park, the guides will start telling you about her recent movements. By now I know this is their way to keep the visitors excited, and I take their stories with a pinch of salt. However, everyone at our lodge was also confident that sighting of Collarwali tigress is a high probability. This being June, I was hoping that the lure of water would bring them out to the water bodies. In fact, we did start looking for them around water bodies. As luck would have it, all our hopes turned out true. Within minutes, we found a tigress walking lazily towards a small pond. Her yellow striped passed through the maze of trees, appearing and disappearing alternatively. She then navigated the ups and downs of the jungle terrain and finally reached the water body. She sat in the water for some time – in that extreme dry heat I wished I could join her. 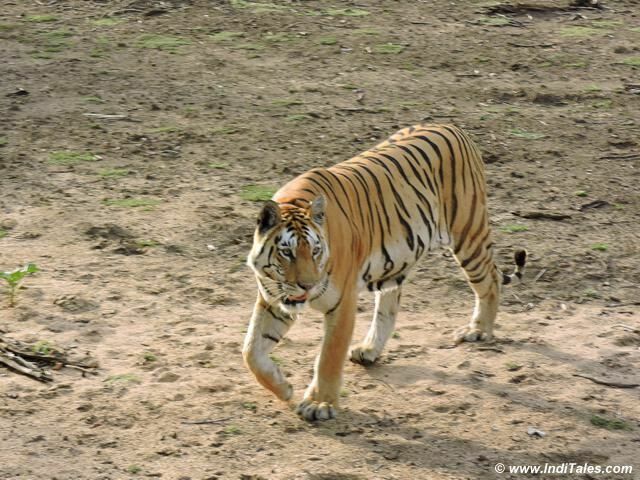 This was not Collarwali tigress but her youngest daughter, who is just about a year old. The young one after playing in the water a bit decided to walk around the jungle and its path crossed the paths of tourists jeeps at Pench National Park. We all stopped, and with bated breath, watched it cross the path, walk into the other side of the path and again walk through the trees. After a while, Collarwali tigress walked in – almost following the young one’s path – reminding me of mothers who run after their children. She saw the water body and sat down to drink some water. As she looked at the water, it almost felt like she was having one private moment – admiring herself in the water. I missed capturing her reflection due to the distance and angle between us. It was lovely to see her admire herself a bit, drink water and then get up like a mother who has a long list of things-to-do. She walked the same path as her little one and after a while, both of them walked back together. I was re-creating the potential conversation both of them had before they started walking back. Collarwali tigress was far smaller than Munna tiger I met last season. My guide told me that the size difference is normal between the two genders of the tiger family. 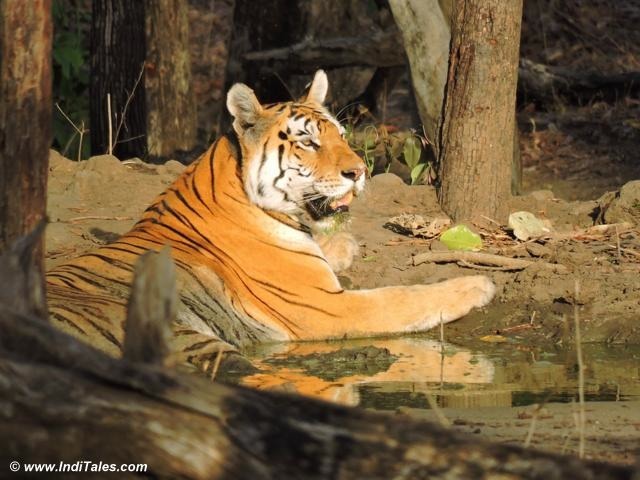 All of us had a satisfied look – as if the purpose of making a trip to Pench has been met. Next day early morning as we entered the Pench National Park after sucking in a freshly plucked Mango from a tree outside. We decided to look at the rest of the jungle, especially the birds. This time, we stopped to see the herd of deer play, to admire the ever lost sambar deer and to hear the calls of birds. Birds obliged us well for next one hour – but I will tell you that story another day. Look at that royal gait! As soon as we reached a crossroad – we saw 5-6 tourist jeeps lined up with all their cameras pointing towards one direction. We joined them to see that Collarwali was taking a walk with her two cubs – the daughter we met last evening and a son of the same age. Our guides tell us that the son is a bit shy and usually keeps away from the human species. Mother and daughter are more used to humans and do not alter their paths for the jeeps lined up to see them. Sometimes I feel they understand the National Park tourism economy and their role in it. They play around and make appearances so that all those dependent on their appearing have their kitchens running. Yes, the Collarwali and her daughter boldly passed between the jeeps while the son took a longer route to avoid jeeps. The three of them kept walking and we kept chasing them, meeting them at various crossroads. We followed them till they decided to go across the Pench River and sit on the stones. I am sure they were also feeling the absence of water in the river as they negotiated various rocks. Once they were settled on the rocks, it was time to say goodbye to them. Most of us were silent after these generous and overwhelming sightings. These would remain my most memorable Tiger Safaris for a long time to come with Collarwali Tigress the star of the jungle safaris. Recommend you to read following travel blogs on Indian National Parks & Wildlife Sanctuaries. Home to Single Horned Rhinos – Kaziranga National Park. 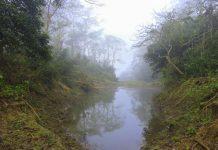 Nameri National Park & Tiger Reserve. Chambal River – Ecosystem & Ravines. Meeting Munna Rock Star Tiger at Kanha National Park. A very good article on tigers of pench national park. 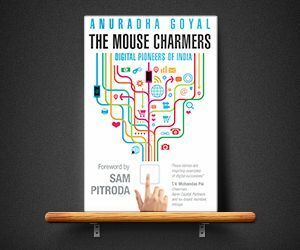 Thank you Anuradha Goyal.. Being a wildlife enthusist i am always on lookout for such articles. looking forward to read more such articles from you. Thank you Amarvir. 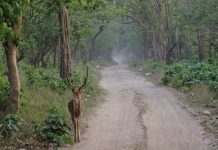 There are quite a few stories on wildlife of India on IndiTales, do check them out. Stay Connected. Wonderful pics. You are lucky to spot them and click memorable pics. Thank you Swati. I am truly blessed to be living the life I have. 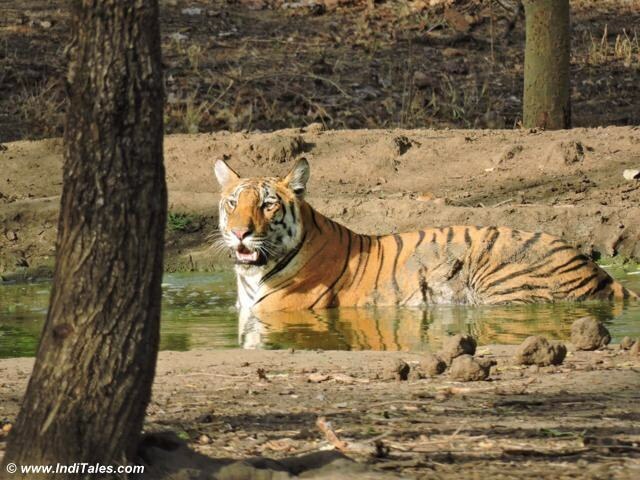 Yes, this time, I got generously lucky with tiger sightings at Pench. Thank you Shaurabh. After meeting Munna and Collarwali – yes it feels we are talking about humans and not animals. This time we got very lucky with the sightings, so could take these shots and videos. What an elegance of the Collarwali Tiger! Thanks for sharing. With us she was benevolent this time. Telling us, see me as much as you want. Next time don’t blame anyone if you do not see a tiger in the forest. Hi Anuradha! Loved reading your post specially with captions “Shy son of Collarwali Tigress”, “Daughter of Collarwali Walks in”. I found this blog very fascinating. 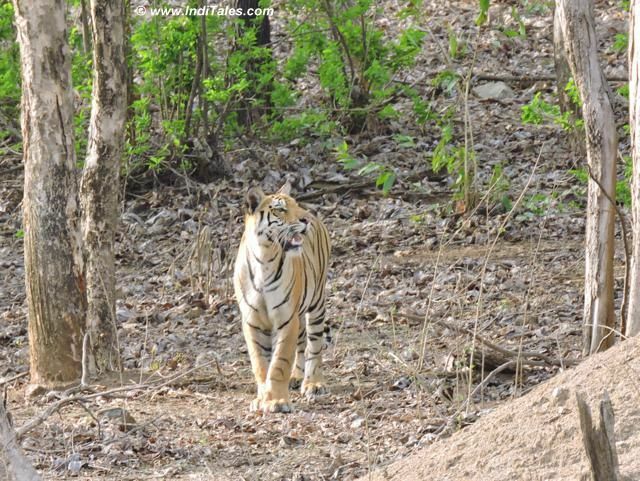 This sure a special video of the main attraction at Pench. i have never heard of this tiger, but now i think i know everything about it, thanks to you. Thanks Sumit. 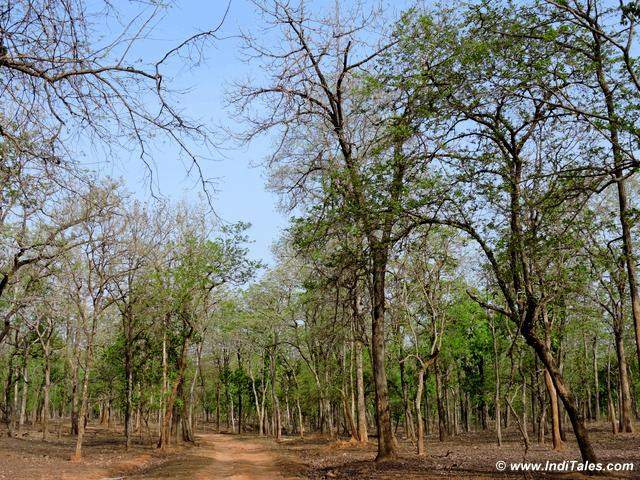 Yes, Collarwali is the star of Pench. Glad you enjoyed the post Satish. Have read your article on collarwali of Pench it is written very nicely but wanted to tell you that as you have mentioned the sightings are of June 2016 and you have written that along with 2 female Cubs there was a make cub of same age which is wrong as that make cub is of her 5 th litter and he was almost 2.5 years old that time and the female Cubs were of 1.5 years with your detailed description you should have mentioned that this was a unique thing where in her 5th n 6th litter Cubs were together as such thing is not recorded as of in India. Thank you, Sagnik for helping us with this information about the cubs of Collarwali. I was not aware of this important fact that cubs from two different litters moving together is an exception. 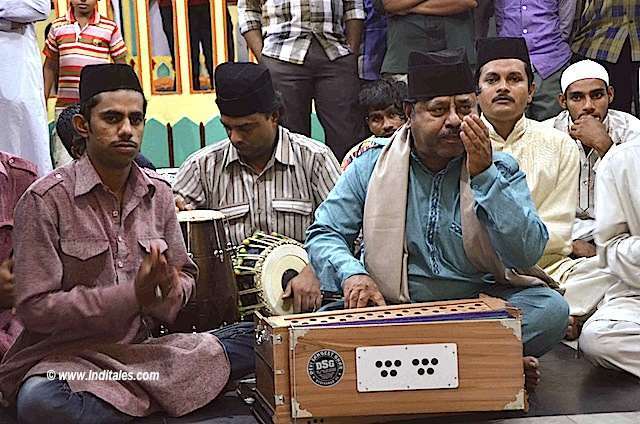 Hi Anuradha very well written article . The pictures and videos are beautiful. But I have one basic question -how can a tigress have 6 litters between 2008 and 2015? As per my knowledge, usually there is a gap of around 2 years before the cubs move away from their mother after they are born. As sagnik mentioned did she manage two litters simultaneously? Any idea /information you have from your visit to Pench last year? Every tiger behavior is different. Her two liters came together for a while. It happens. And observed in some other tiger reserve also. Once the cubs are separate they come back again for a small time and then disappear. Since they are not matured enough for meting and establishing own territory these young tiger often gets confused and stay with there mother. 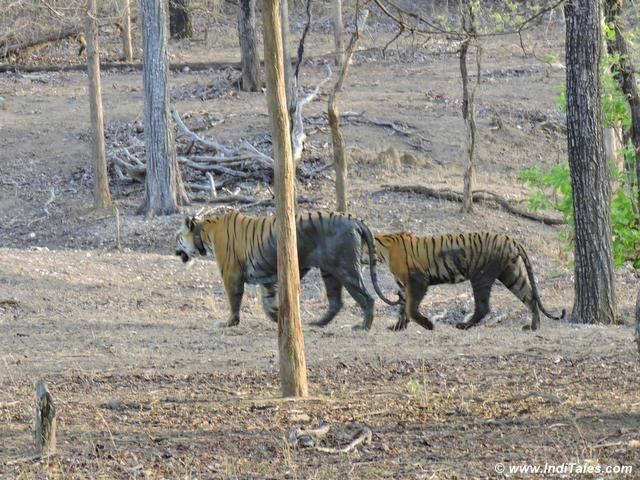 One of the example is from tadoba where few years ago 4 female tiger (sisters) separated​ and then they came back again in there mother’s territory. Thanks Chinmay for adding to this. I don’t agree on this that such behavior where 5th and 6th liter cubs together never recorded is not true. I don’t agree . there are so many photographic evidence from Bandhavgarh tiger reserve and other tiger reserves where female tiger with her 2 liters recorded. Another important thing is we know only 20% of our tiger reserves have you checked data with forest dept. ? because forest dept. knows the entire park. So, please check the record. 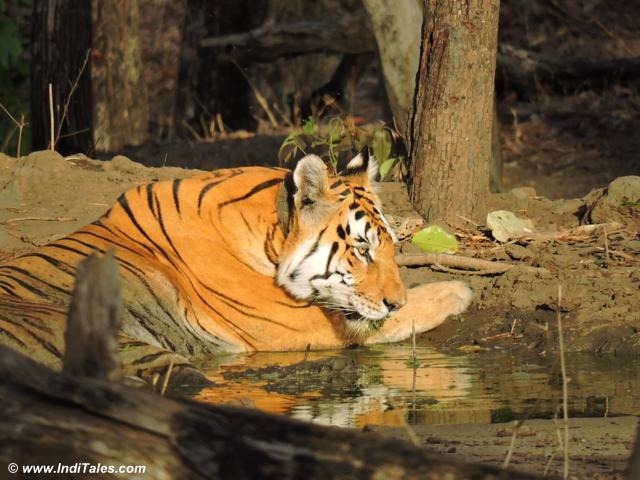 On last I had seen 2 liters of one female tiger together in kanha. 2 years ago. Thanks Chinmay for this discussion.